WHO: No. 19 Ohio State Buckeyes (1-0-1) at Miami RedHawks (1-1). NOTES: Miami has dominated this series in recent years, but Ohio State is ranked No. 15 in the USA Today poll and 19th in the USCHO.com rankings. The Buckeyes are coming off a 3-2 win over then-No. 3 Denver in Denver and a 3-3 tie vs. Air Force in the Ice Breaker last weekend. 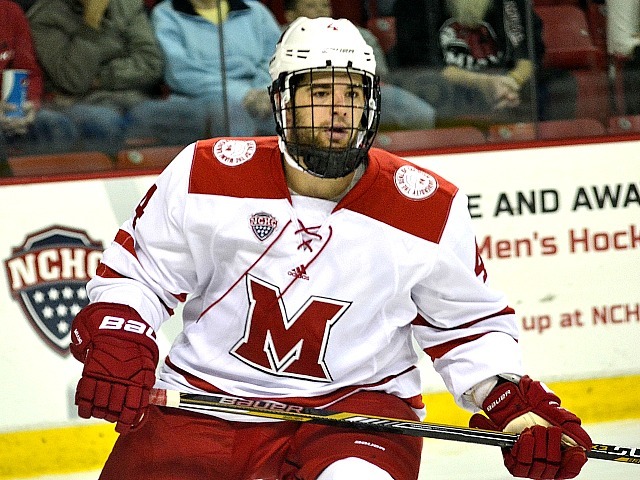 Defenseman Matt Joyaux is a Miami transfer (photo by Cathy Lachmann/BoB). OSU put 82 shots on net last weekend, including 49 vs. Air Force. John Wiitala scored a pair of goals, and five other players also picked up two points, including RedHawks transfer and defenseman Matt Joyaux. Senior Christian Frey started both games in net last weekend, but classmate Matt Tomkins relieved him in the second game, stopping all 10 shots to salvage the tie. Based on that, it would appear likely Tomkins would start between the pipes in this game. He is 16-21-5 with a 3.24 goals-against average for Ohio State. He has struggled vs. Miami with a 4.05 GAA in four games while Frey allowed two goals in his lone appearance vs. the RedHawks. The Buckeyes are a balanced team in terms of class size, with seven seniors, seven juniors, nine sophomores and five freshmen. Three rookies played in both games last weekend and another dressed once. Miami has won seven straight games against Ohio State and is 11-1-1 in its last 13 in this series, including a 4-0 record at Cady Arena since the 2013-14 season. Overall, the RedHawks are 75-62-13 vs. OSU and 46-22-4 in Oxford. Normally these teams play a home-and-home series the same weekend, but this season they meet in Columbus on New Year’s Eve, likely to break up a long Christmas break for both. Posted on October 15, 2016, in 2016-17 and tagged 2016-17 preview, Matt Joyaux, Ohio State Buckeyes. Bookmark the permalink. Leave a comment.